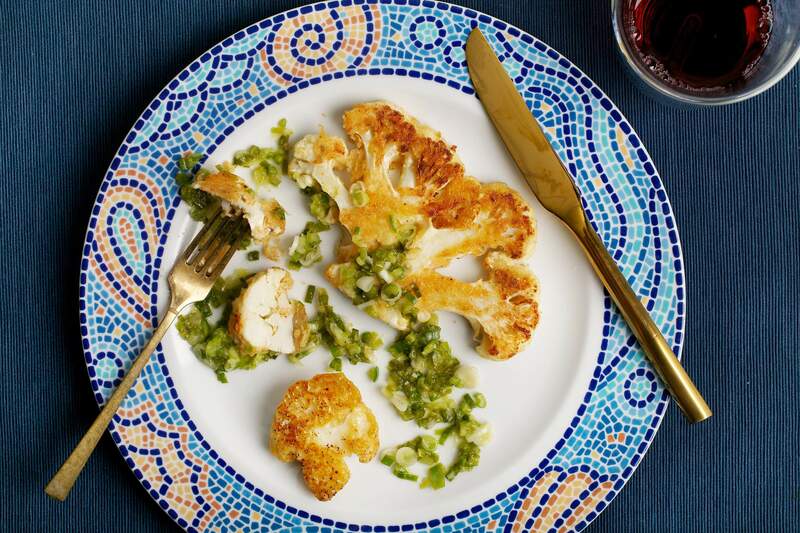 Crispy Cauliflower Steaks With Ginger Scallion Sauce. The last time I made cauliflower “steaks,” I was playing with the chicken-fried idea and I served them with a miso-mushroom gravy. This time, my approach is lighter and brighter. In this recipe by Jodi Moreno in More With Less (Roost Books, 2018), they’re coated in a chickpea-flour batter, pan-fried and served with a chunky, sharp sauce made from thinly sliced scallions, grated ginger, sesame oil and lime juice. The only trick to cauliflower steaks, by the way, is in the cutting. It’s hard to know just how many steaks you’ll get out of a head, because at a certain stage of the slicing you’re out of stem, which means that the florets no longer hold together. No worry. There’s enough batter for you to fry up all the stray bits, too. For the cauliflower: Trim and discard the green leaves and any brown stem off the bottom of the cauliflower. Place the cauliflower on a cutting board, stem side down. To create steaks, you’ll be starting in the middle and working your way outward. Cut the cauliflower down the center, then cut each half into 1/2-inch-thick slices, starting from the cut side and working toward the outer edge, repeating until the steaks no longer hold together. You should end up with 3 or 4 whole steaks. Break up the remaining pieces into florets. Source: Adapted from More With Less: Whole Food Cooking Made Irresistibly Simple, by Jodi Moreno (Roost Books, 2018).